We offer a trade in deal for the JB4. If you bought a JB+, you can trade it in for a JB4 and get the full $199 credit back. Hello thank you for the quick response. Great service ... yes i am the owner of that. Jb + and I have it currently installed and drive it .. But now I want to update on the Jb4 ... How it works .. Can you tell me what I have to do exactly so that I can order the Jb4 and the money for the jb + get back? For the upgrade program (at least, BMS' program) you order the JB4 off our website and send in JB+ after with receipt (from any authorized dealer or BMS direct) and we'll refund the JB+ against your JB4 purchase. x-ph might have their own program for upgrades so you'd have to discuss how theirs works directly. Have it at Jb4 Europe bought in Germany .. But have no more bills .. Can I send it without a bill when buying from Jb4? Unfortunately not, sorry. A receipt is required from JB+ purchase to take advantage of upgrade program. Upgrades are allowable within 1 year of JB+ purchase. hello terry, can you please tell me if I need only the EWG wires for the 8 T12 Hex in Map 6 or the fuel wires too? would test it as soon as my new JB4 is there! If doing map6 tuning for absolute boost profiles, the EWG connector is suggested. No need for the fuel pressure wire. It has minimal if any benefit. 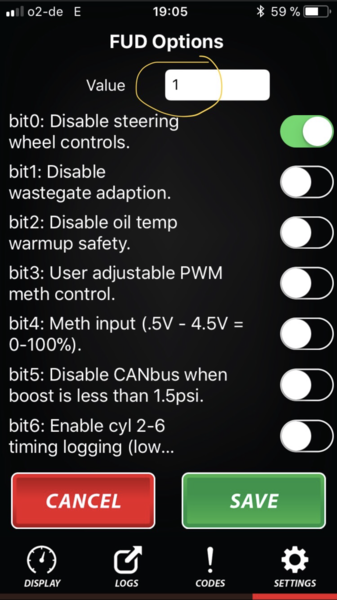 Working on a new firmware tweak for the B58 and could use some help testing it out. Right now it's only active on maps 6 and 7. It changes how the JB4 spoofs the IAT signal to alter boost target, timing, and AFR targets. To test it out load the T12 firmware in the first post, set FutureUseD bit#2 to 1 or on, set 6cyl timing to 1 (e.g. make IAT as high as possible), and evaluate/record a log or two for us to check out. You can run the new firmware full time. Just set FUD#2 back to 0 to disable the test feature if you don't like it. What changes are we supposed to notice with this version? The JB4 manages the mapping dynamically based on logs of inputs from CANbus. If you want to evaluate what is going on look at your log, boost is actual, DME BT is what the DME is requesting, and ECU PSI is what the DME is observing. Passive delete is on the WMI page for those outside USA. Development is always ongoing. If you want to help the cause post some logs from the track and we'll see how its running for you. sorry for the late response. Long vacation without my computer. I will email you the log from the track now. I can't look at logs. This is a pre-sales enquiry. Surely there must be a threshold at which MAP sensor PSI = ECU PSI and strays splitting gradually from there to keep throttle mapping smooth? I installed the JB4 box in June 2017 in my 140 and have been driving without any issues by now. So first of all a big thanks to you and your team. I downloaded the newest Version yesterday (BMW_B48_B58_OBDII_8.hex) and installed it via Laptop. To be honest, it was the first time, that I was connecting my own Laptop to the Box, because my Tuner installed the Box for me in the first step. I am running a HJS 300cpsi catalyst and 102octane Aral Ultimate only. Is there any possibility to go "beyond" map3? And since I installed the JB4 I have a problem switching gears while giving full throttle, which increases with map stages: I have a accleration "delay" immediately after switching to the next gear with full boost. It feels like the turbo boost stops for like 0.3 secs or sth. As mentioned this increases with the more power I drive from jthe b4. I'd recommend posting a new thread in the BMS Support Request subforum. 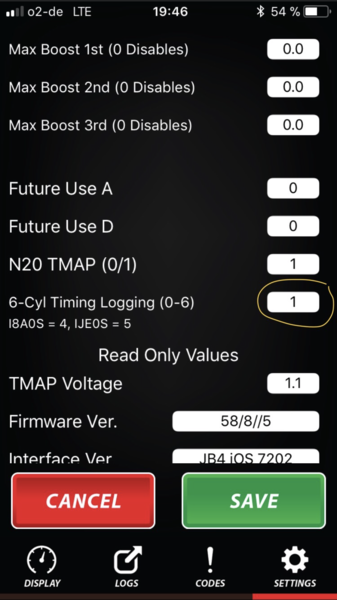 You'll need to record a few 3rd gear Sport+ WOT logs (without depressing kickdown button at the bottom of the accelerator) logs. What is the 8 t12 hex update for? I run the most aggressive (on the last firmware it was #5 I believe) on 93 octane with the same diameter drainpype from turbo to midpipe, EWG connector (FUD set to 30), BMS filter, etc. Can I benefit to anything in this new firmware? Is there some type of autotune for boost map yet in this update? Hello Terry, I have now loaded and installed the 8 T12 Hex firmware. Now I have Future Use D set to 1 (then goes off Bit0 - steering wheel control! ?? ), is that correct? then I set 6-cyl Timing Logging (0-6) to 1.
did you have the trial on his and i could test it? see pictures. It is not saved yet and could be your answer first. can not be activated Map6 is not working? For me in the trial only card 1-5. Logs are CSV files, not JPGs. Change Bit 2, not Bit 0. All other Bit options are irrelevant to the test change. You need to be connected to the JB4. They don't show up if you're just playing with the app. It's mostly so Terry can gather data to implement possible new developments. No, you should not gain any power, etc. The only way to get more power, currently, is by running meth. I change bit 2 (disable oil temp warmup safety) to on and will drive a few logs. I'll post the logs in support.